2015 Visit us at Facebook! The year of the horse is galloping in! The 2014 Chinese New Year falls on January 31, 2014. 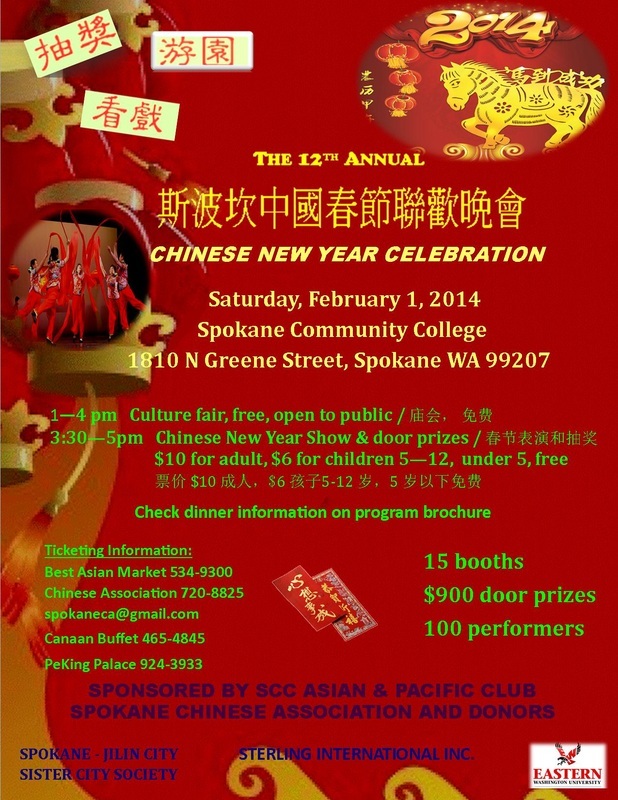 According to the tradition here in Spokane, a big celebration is usually organized by Spokane Chinese Association with the support of many other organizations and individuals every other year. This year is due for a big celebration which consists of culture fair, performance and meal. The format might be a little different from the past, but you will for sure have as much or even more fun. Pay attention to future emails concerning the exact time and location of this festive event(one of the weekend day in early February). 1. Give suggestions what activities or booth the Chinese culture fair should include. Recommend yourself or others to lead an activity or host a booth. 2. Be a volunteer to help with the Chinese culture fair or stage work (A volunteer sigh-up form will be sent out to you soon). 3. Recommend yourself or others to join the performing team to put on a show. 4. Recommend businesses and organizations that might be interested in supporting the event with door prizes, gift cards and so on. 5. Be ready to buy tickets to come to the celebration! Time to get excited and take some actions. Hope to hear from you soon. Happy Chinese Moon Festival 2013! Please check the flyer for details. Once you decide to join the celebration, please register ASAP from the form below Thank you! Welcome back from summer vacation. Hope you all had a pleasant summer. 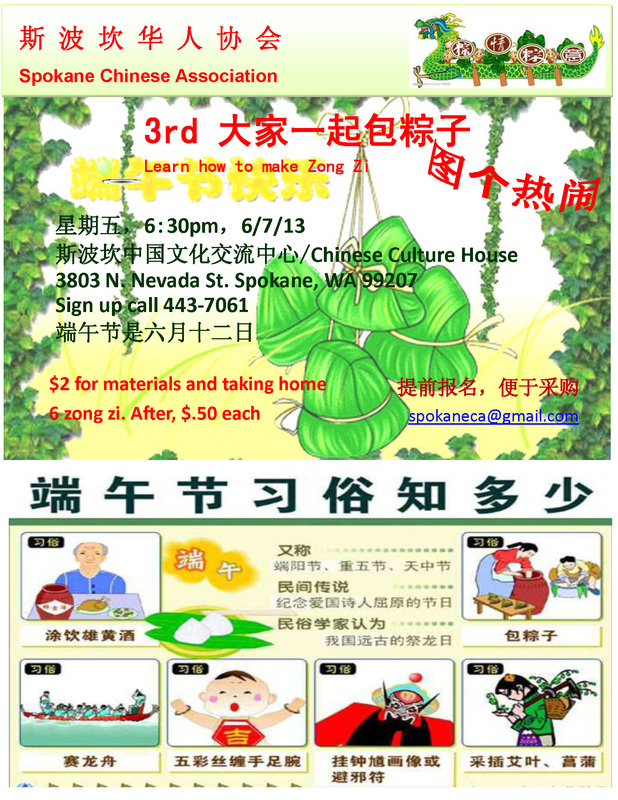 OurSpokane Chinese School will start on Saturday, Sept. 14th. Please read the following information about enrollment, classroom arrangement, and new student enrollment form. Please feel free to contact me if you have any questions. 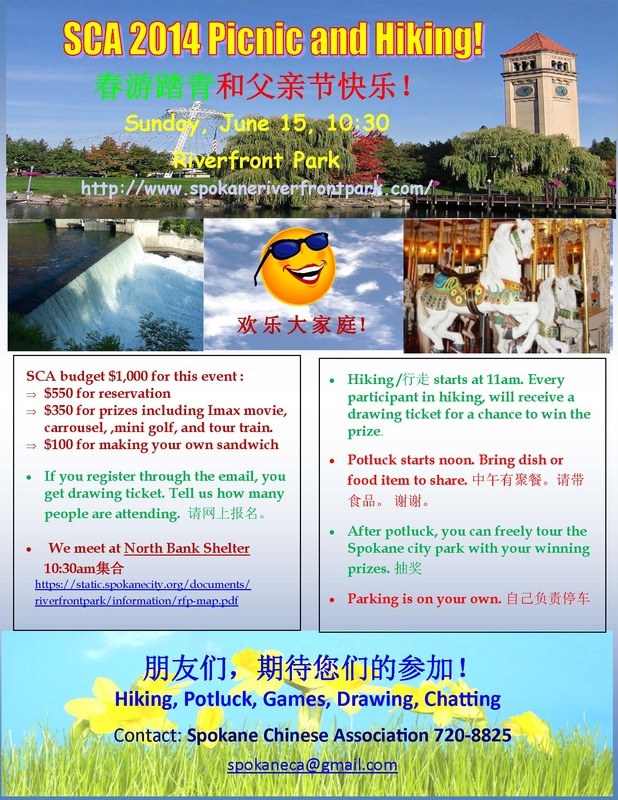 Also, please visit our website at http://www.spokanechinese.org/chinese-school-20013259912339826657.html for updated information. Summer is so…. beautiful around us! Hot, Hot, Hot! We are planning a cool down event for you, especially for these people and families who just moved to Spokane. Come out to meet us and have a good time together. Great news! A new CLTA-WA(Washington State Chinese Language Teachers Association) workshop will be held at Gonzaga February 16. 1. 8:30 a.m. -9:00 a.m. Refreshment and social time. Signing up for the workshop. Questions and answers on CLTA-WA membership. Information about March 26 workshop in Seattle. 2. 9:00 a.m. -1:00 p.m. Tiffany Lin will introduce and demonstrate different kinds of fun activities that a Chinese teacher can use in his/her classroom to engage students of different ages and background. Light breakfast and lunch will be provided. All who are interested in Chinese teaching are welcome!